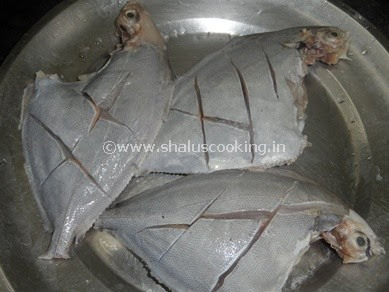 Pomfret Fish Fry, We call Pomfret as Vaaval Meen in tamil and Avoli in Malayalam. I have never tried frying a full pomfret fish (I mean without cutting it into pieces). But my husband was asking to make this for a long time. I did not try it, in the fear that it might break while frying. Even in this recipe I have not tried something different, I just applied the usual masala that we apply for any fish fry. But it not break so much as I feared. Small piece came out here and there but not too bad. Pomfret Fish - 6 No. 1. Wash and clean the fish and make slits on both sides. 2. Take a wide bowl or plate and add all the ingredients mentioned under "For Marination" section. Squeeze the juice of lemon and make a thick paste. Sprinkle water if required. 3. Apply the masala on both sides of the fish. Particularly apply masala in the incision made. Let this fish marinate atleast for an hour. 4. Heat oil in a kadai, and shallow fry the fish one by one. Fry it on both sides till the fishes turn brown color, Make sure to lower the flame while frying else the fish will be browned outside but it will not be cooked inside. Once the fish is fried well, drain the oil and transfer it to a paper towel. Easy Pomfret Fish Fry is ready. Serve it hot with rasam rice, this will be a heavenly combination. Always, fried fish will taste better when hot.